The urban way of living is constantly making us lonely and amid this loneliness and hectic lifestyle, young urban Indians are facing great difficulties in finding the right match for a serious relationship. Although, there are many dating apps and matrimonial sites, still Singles in India are not getting appropriate results. 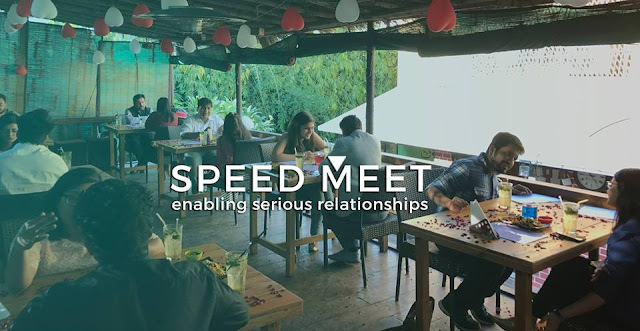 In order to enable serious relationships through offline events, Speed Meet, the newest Speed Dating start-up has taken the risk of breaking the ice between urban singles looking for love, not hook-ups. This speed dating company organize events across India and they keep these meets completely safe for girls from creeps. These are invite-only events and only eligible people are allowed to attend it. I had a long interaction with this innovative startup lately and out of curiosity, I bombarded them with questions, which they answered brilliantly. So, let’s find out what lies ahead for India’s newfound love for Speed Dating. Speed Dating in India – The idea sounds too ambitious for a country like India, what motivated you to start this? Well, that’s how I thought of it at the onset, but frankly, I was surprised after I started organizing real speed dating events. The creepy experiences people face on the Internet has created a room for offline communities, but this is for classes and not the masses. Speed Meet is not just a series of speed dating events; it is, in fact, the community, built through an inter-personal scrutiny which the applicants go through after applying. Why speed dating events when you have so many dating apps and other social media platforms? Exactly why you need Speed Meet (not Speed Dating) because anyone and everyone can join a dating app. There’s little you can do as a dating app to stop that. 1. There are a lot of fake profiles! There’s nothing dating apps can do about it. 2. You are bound to judge people by their pictures and we all know how Instagram filters can be deceiving. 3. People are different virtually and in reality. You might be investing in a person online who’s totally not your type. 1. Nobody can fake because it’s a social gathering and there’s scrutiny! 2. The format is such that you see and meet people in person. They won’t look different when you meet them the day after. 3. You are not liking-disliking random profiles based purely on looks; you meet a person and get to know their personality. Who is eligible for such events? - Well educated and well read people. - people who are up for having conversations. - Interests, hobbies should match with other participants in the pool. - Shouldn’t be on the move always. - People who are looking for something serious or a long term relationship. What if you go to a speed dating event and you are rejected? How to survive the humiliation? Good question. First up, there's no humiliation in not getting a match and neither do the attendees feel so. For people with zero matches, we personally help them to understand what went wrong (attendees are encouraged to record the reasons for putting a Yes/No). The instances of zero matches are generally very low because of our amazing selection criteria but if it does, it’s a bad day; we help and coach the participant. As an industry expert, what tips you want to give to singles aspiring to attend such events in future? We send basic guidelines to our attendees but the most important thing for things to work out is to be yourself! How will you approach shy men and women, the introvert types to come to such events? The format of our event is so appropriate that shy men and women do not find it difficult at all; they’re actually able to open up and mingle because it’s one on one, rather than people hanging out socially in groups. We have events for 26 and above singles in Delhi, BLR, Mumbai, Pune, Hyderabad, Calcutta. - Even if an introvert, should be all in for conversations. - Then interest hobbies should match with other participants in the pool. - Shouldn’t be on move always. - People who are looking for something serious or a long term relationship! Is India ready for speed dating? I’ve hosted 40 events in 7 months, enough said haha, including Hyderabad, Pune, and Calcutta. The answer is a definite yes! All my events are 1:1, an equal number of men and women. I would like to share an insight with you, due to the safe and creep-free community we have curated, I’ve higher female applicants than men. An interesting insight from the events applications. What is the future of dating in India? India is going through a transition where individuals have started deciding the right one for themselves and parents also find that more comfortable over finding someone for them in closed circles or matrimony sites. I personally believe online dating will rock for hookups, but for long term relationships, young professionals are increasingly looking to invest time and money in real, interpersonal platforms like Speed Meet. Our success so far is a testimony! Tell us something about your upcoming events and how interested people can contact you?